We must go back before we get to that. She became a lady-in-waiting to Mary Stuart, Princess of Orange, and there, she attracted the attentions of James, Duke of York. She gave in to him, got pregnant, and James married her, much to the extreme disapproval of his mother, Henrietta Maria, and his other family members. 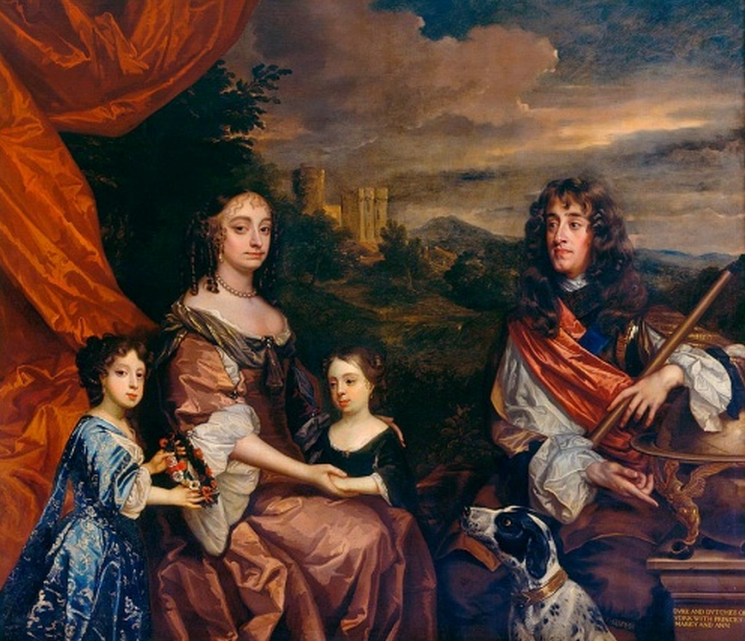 Mary, in particular, found it offensive that her former lady-in-waiting was married to her brother – a royal and son of Charles I. I find this ironic because Mary’s son, William III, would one day marry Anne’s daughter, Mary. Ha! Royals thought it was mixing royal blood with ink! Scandalous! That trollop! Nevertheless, in spite of some malicious gossip against Anne’s character, she became Duchess of York and she and James had several children – only two of which survived. These two girls – Mary and Anne, later became Queen Mary II and Queen Anne. Others later rumoured that Anne Hyde’s father – the Earl of Clarendon – had married Charles II off to the barren Catherine of Braganza in order for his grandchildren to inherit the throne. This is just ridiculous. Anne was intelligent and witty, and what she lacked in aesthetics she certainly made up for in conversation. Her husband was typical of the Stuart men, very handsome, very virile, and very promiscuous. She had a great deal of control over James, but not in the area of his sexuality. He had well-known affairs with many women, including Arabella Churchill – sister of John Churchill, the man who would later become the 1st Duke of Marlborough. Perhaps as a result of the unhappiness she felt as a result of James’s flagrant philandering, she, in turn, became an over-eater and grew very heavy like her father – this propensity to gain weight plagued both her daughters, Mary and Anne, though Mary tried to control it by walking regularly. Anne, though brought up an Anglican, became a Catholic after she married James, and some believe that she may have brought him ’round to converting to Catholicism as well. This conversion would be a major factor later in his life – in the many plots against him, culminating in the Glorious Revolution of 1688/89. Anne Hyde, Duchess of York after Sir Peter Lely. Photo: The National Portrait Gallery, London. 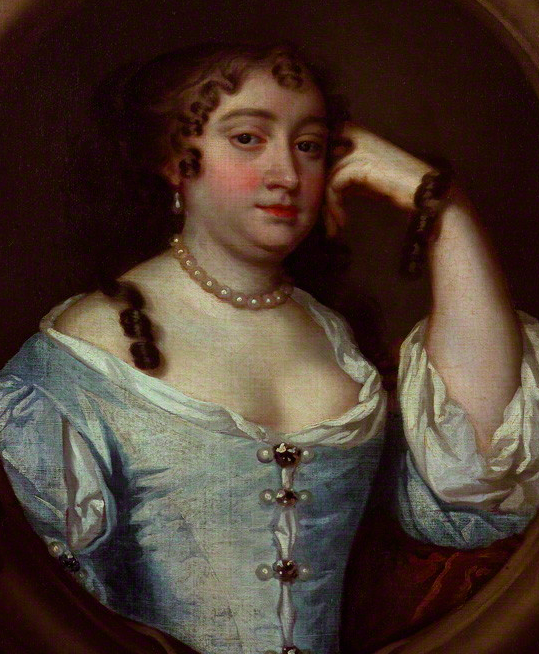 Anne is best known for commissioning The Windsor Beauties by Lely around 1662-5. The Windsor Beauties is a collection of portraits of eleven of the most beautiful women at Charles II’s court. From Barbara Villiers, to the famed Britannia, Frances Stuart. You can see most of them online at the Royal Collection. 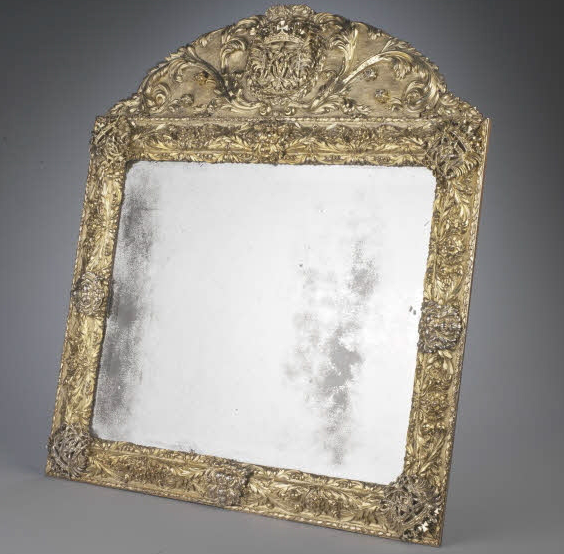 This mirror once belonged to Anne Hyde, and is now owned by the Louvre Museum in Paris. As for Anne, she died on the 31st March, 1671, aged 34, probably from breast cancer. She was interred in Westminster Abbey. One of her portraits hangs in Hampton Court Palace, and another in Kensington Palace. Yes, it’s deliciously ironic. Can you imagine if William and Mary’s mothers were still living when they married? To be fair though, Mary and the other royals may have been a little sensitive at the time about their royal status, jealously protecting it from anything that would make it look less special in the hope of avoiding a repeat of 1649. That must have been a horrifying experience for the family of Charles I.
Pingback: Talking with Andrea Zuvich about Those Oft Forgotten Stuarts in History | Oh, for the HOOK of a BOOK! Hyde Bank Hall/Farm. Romiley, Stockport, Cheshire has always been locally believed to be the birthplace of Anne Hyde. Sources say little is known of her early life so this could be true. Hyde Bank Farm has a website for you to peruse. Emilio de’ Cavalieri → ← 400th Anniversary of André Le Nôtre’s Birth!